A group of recent grads designed a revolutionary new model for higher education. No matter your financial background, you can go to college. Any college in America can now make its bachelor's degrees accessible and affordable for all. College 2.0 spreads out the cost of educating students among graduates, meaning students don't have to pay anything while they study and alumni contribute an affordable amount based on what they earn. College 2.0 is a new funding model in which institutions invest in their undergraduate students by covering their up-front costs. In return, students support their school with a small percentage of their income for a set period of time. No interest. No debt. Always affordable. Barriers to college access are gone, and schools finally see the growth in revenue they need. There's even a free-tuition option for states that want to cover education costs for their students: State College 2.0. College 2.0 accomplishes something long believed to be impossible: stopping tuition increases, making education affordable for all, eliminating student loans, and generating more revenue for cash-strapped colleges. The plan allows institutions big or small, public or private, to provide an education without financial barriers to students of all income backgrounds. FICS America designed flexible options for colleges to cover those initial up-front costs as an investment, eventually generating a growth in revenue by spreading out contributions over time after students graduate and enter a career. By doing so, those contributions can be smaller and responsive to each graduate’s income. There is no interest and no middle-man—contributions go straight to schools. Colleges that sign up to "go 2.0" first work with FICS America to develop a version of College 2.0 that is right for them. Once the plan is approved by the college's leadership, the institution gradually transitions from charging incoming students up-front tuition to post-graduation contributions. As more College 2.0 students contribute back, their college’s funding grows to cover the up-front costs of additional students until the transition is complete, and graduates’ contributions cover enrolled students. Between 2004 and 2014, average student debt rose 56%, more than double the rate of inflation. The longer we wait to fix college, the worse the problem gets. *According to the Institute for College Access & Success and the Consumer Financial Protection Bureau. College 2.0 comes in two versions so that schools can select the best option for them. States that want to cover the cost of college for their students now have a clear plan to do so: State College 2.0. Previous "free tuition" proposals do little to help students who already have all or most of their tuition covered by financial aid, leaving them with mounting debt for all of college's additional costs—room and board, textbooks, transportation, and more. If students meet certain requirements, like graduating on-time, states can cover students' base costs and not subject them to debt for everything else. And with the College 2.0 Algorithm to calculate the details, free college can be a reality. States willing to invest in their students' education can cover contributions for qualifying graduates. And unlike other free college proposals, State College 2.0 doesn't leave students to take out loans for non-tuition expenses like room and board. Any additional expenses are covered through smaller contributions based on income, interest-free. Today, additional expenses and vague promises of financial aid make selecting a college on price nearly impossible. College 2.0 simplifies students' financial commitments so they can know which college is right for them. Core costs including tuition, fees, and textbooks are fully covered and replaced by alumnumbers™, the base contribution percentage and duration that applies all students at a particular College 2.0 school. If a student also uses room and board, transportation, or living expenses, they can avoid student loans and cover those costs with smaller, proportionate add-on percentages instead. No matter your needs, College 2.0 has you covered. You're going to love being a College 2.0 student. Traditional colleges hide their real costs behind a "sticker tuition price" and a vague promise of financial aid. But once it comes time to actually choose a school, it may still be very unclear how much students will have to pay and how many loans they will have to take out in order to make ends meet. Every College 2.0 school will have a different contribution percentage and duration (called alumnumbers). Along with their alumnumbers, schools will display their average graduate income level, making it simple to understand what your financial commitment will be when you graduate. Fed up with student loans? Us too. College 2.0 reimagines students' entire financial relationship with their college, so everyone who wishes to get a college education can do so without detriment to their finances—before, during, or after college. Gone are the days of ballooning student debt and interest payments that show up on your doorstep regardless of whether you can afford them. College 2.0 grads' contributions are based on what they earn, and students can get their education without having to constantly worry about bills and loans. The College 2.0 Model anticipates a certain amount of unemployment, allowing schools to still cover costs while some graduates are in-between jobs. Because College 2.0 schools do better when their students achieve financial success, institutions have an incentive to provide robust career support for grads who seek help finding a job. 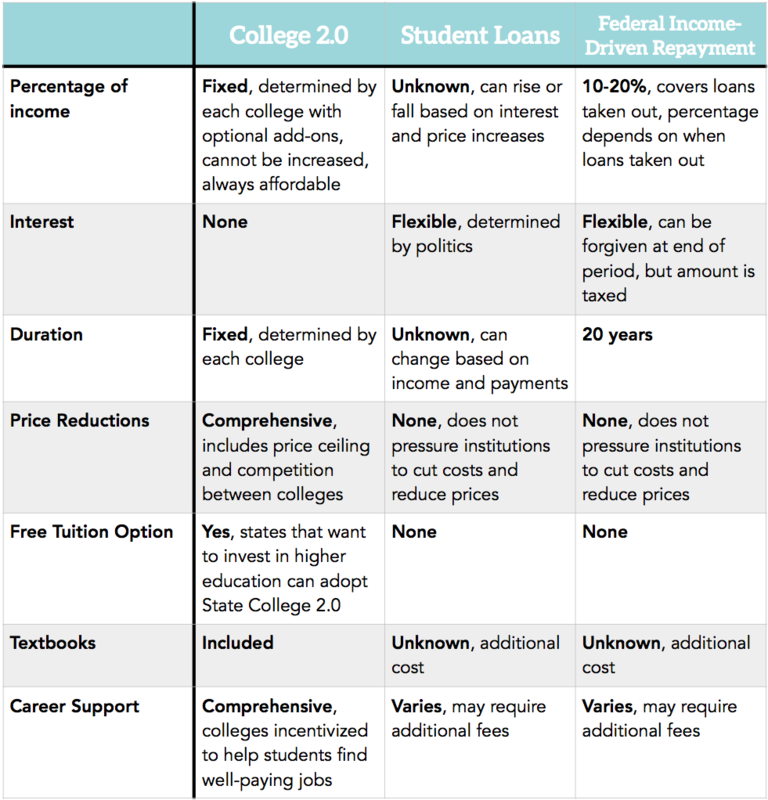 How does College 2.0 compare to student debt? Traditionally, students have to compare college sticker prices without knowing how much financial aid they will receive and, ultimately, how much debt they will graduate with. On College 2.0, students simply compare the contribution percentage, duration, and average graduate income for each school, so they'll have a much clearer idea what their financial commitment will be once they graduate. Congrats! You've been accepted to the College 2.0 school of your choice! Instead of taking out loans like traditional students, the next step is to sign the agreement that clearly outlines your alumnumbers and any additional percentages you could use if you need add-ons like room and board. Get your degree without the constant hassle of continuously applying for financial aid, accumulating loans, and worrying about how to make ends meet. Textbooks? Covered. Lab fees? Included. Live it up, branch out, and learn. You did it! You've earned your degree and you're ready to step out into the real world. Haven't lined up a job yet? Don't worry. Contributions don't kick in until you start getting paid. If you want help finding a job, your College 2.0 school can help. Because your college's revenue depends on its graduates' employment, it has a built-in incentive to help you find a stable, well-paying job. Even if it takes some time, you won't have any financial obligation while you are looking for a job. As soon as you enter your career, your contributions will support your school and make students' college dreams a reality. No bills show up at your doorstep—your contribution percentage comes right out of your earnings so you can focus on where the rest of your paycheck will go. Maybe it's founding a business, buying a home, or starting a family? Whatever your dreams are, College 2.0 contributions respond to your income so they are always affordable, unlike the student loans that stand in the way of the dreams of millions of grads today. If you end up getting a high paying job, then College 2.0's high-income cap limits how much you contribute each year. And after your contribution duration expires, you're all done! You've done your part. College 2.0 covers all fees and materials, even textbooks! Fixing the textbook market . . . The textbook market is fundamentally broken. At today’s colleges, professors assign textbooks based on their content—not their price—leaving students with limited options to shop around for affordable options. Constantly-updated textbook editions limit even rental and used alternatives, meaning publishers can charge high prices without having to worry about much competition. The cost of educational materials is built into students' contributions, so academic departments handle not just selecting textbooks, but purchasing them as well. The professors that assign textbooks will also have to consider cost when doing so, putting colleges in a position to negotiate with publishers and make decisions based on both quality and affordability, ultimately bringing down textbook prices. We're committed to ensuring that everyone, no matter their background, can pursue a better future. Because College 2.0 schools can't raise tuition, they must rely on increasing enrollment and bringing down costs. The price competition introduced by College 2.0, along with its many other downward cost pressures, counteract the forces that have made college so expensive. College 2.0 schools make an investment to cover the up-front costs of the initial groups of students. As more and more grads contribute back, the model pays for itself and then some, allowing colleges to provide a quality education to even more students. Colleges start by working with FICS America and the College 2.0 algorithm to calculate their alumnumbers based on their needs. A committee of representatives across the institution works on hammering out the details with FICS America team members to ensure an efficient transition, including how startup costs can be covered. Once the college has mapped out its plan to “go 2.0,” it signs up with the College 2.0 office of the IRS, which handles the collection of student contributions from their earnings and sends them directly to participating colleges. The transition starts with a percentage of incoming first-year students attending on the College 2.0 plan—no upfront costs, but contributing a percentage of their income after they graduate. As those students begin to graduate and contribute back to their institution, the college puts those new funds toward covering the costs of more students to attend on 2.0. Eventually, all students at the institution will be on 2.0. If students need help finding jobs, the college can use its extensive network of private and public industry contacts to act as an agent and help its students find careers. With time, more and more of the institution’s funding will come from post-graduation contributions. As this happens, the institution will be able to have stable, predictable revenue, ending the paycheck-to-paycheck funding structure so many colleges struggle with today at the hands of unreliable state donors and fluctuating economies. The plan also has built-in performance funding incentives, like encouraging students to stay in-state after they graduate, stimulating the local economy and incentivizing states to provide additional investment. And because the College 2.0 algorithm calculates the model with conservative numbers and inflated unemployment rates, the college knows that its finances can withstand any economic fluctuations. Think of College 2.0 like your favorite movie streaming service. For the price of a movie ticket each month, you can stream thousands of movies as much as you want. This works because millions of people pay each month, which at scale means each subscriber can enjoy more value for their buck. The economics of College 2.0 works the same way. With more graduates contributing over a long period of time, everyone is able to contribute much less each month while supporting the costs of students as they study. How did a group of undergrads solve the student debt crisis? Along with College 2.0's groundbreaking policy plan, FICS America developed a proprietary algorithm that does the crucial under-the-hood calculations that make the model work. 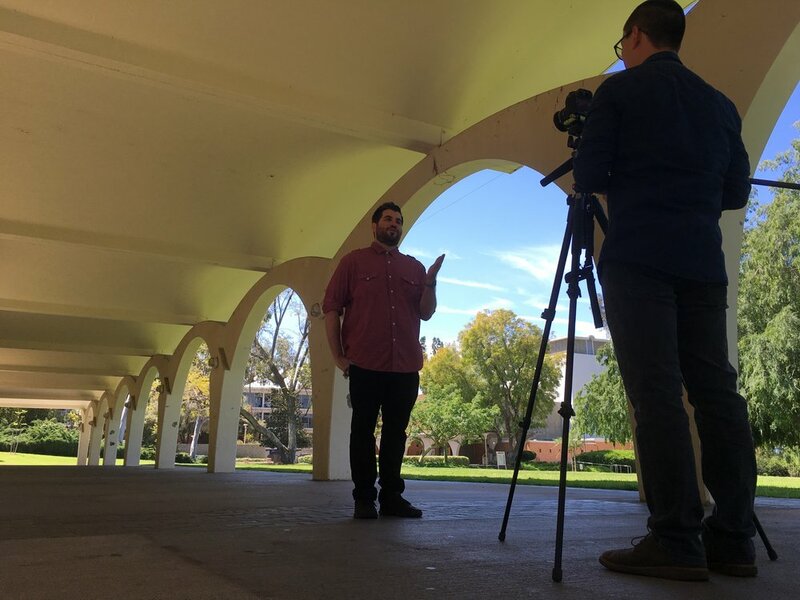 College 2.0 dates back to the spring of 2011, when a group of students at the University of California came together to address the skyrocketing tuition costs and student indebtedness at their university. That early version of College 2.0, called Fix UC, garnered attention from schools across the country, leading us to spend the next several years retooling our model for any college, big or small, public or private. Each FICS America team member has first-hand experience with the broken higher education system. No one is in a better position to solve higher ed's greatest problems than those who have actually dealt with them. Each year, more students graduate with more debt. The time to fix the system is now. College 2.0 aligns the interests of both colleges and students while maintaining complete freedom of study and work. The secure, seamless way to support your college. Students should be able to support their schools without having to worry about the security of their information and finances. That's why we designed the College 2.0 SendSafe Program, a revenue-neutral program that uses the existing IRS tax system to collect College 2.0 grads' contributions automatically from earnings and send them directly to schools. Although College 2.0 is designed to require as little federal lawmaking as possible, the model needs two pieces of legislation to function properly. The first is the creation of the revenue-neutral College 2.0 SendSafe program of the IRS to collect and distribute student contributions using the existing tax system. The second is the extension of GI Bill benefits to College 2.0 institutions so veterans can enjoy the benefits of College 2.0. Both are bipartisan and crafted for political expediency, so we can immediately make college permanently affordable and accessible for all. Once the necessary laws have been passed, the IRS will need to staff the SendSafe office and work with colleges transitioning to College 2.0. Tax documents, including the W-4, W-2, and 1040, must be updated to include College 2.0 contribution information. As College 2.0 graduates begin contributing, their funds are collected by the IRS using the current employer withholding system, simply adding College 2.0 info to Form W-4. Employers won’t have to take on any additional responsibilities. The sole new duty of the IRS is the distribution of contributions to participating institutions. What will it take for College 2.0 to happen? FICS America is a nonpartisan, nonprofit organization dedicated to empowering students to solve the student debt crisis. 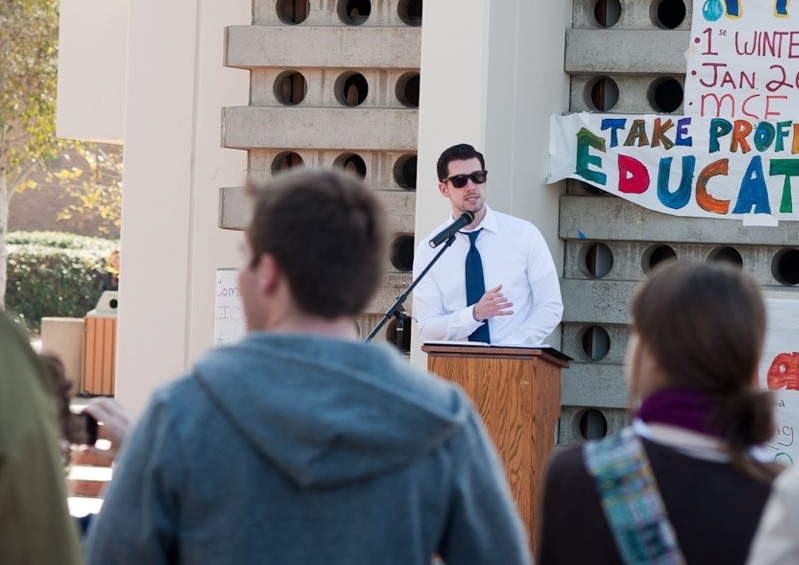 If College 2.0 is to happen, it must be students who take the lead. Because College 2.0 is a plan for individual institutions, each college must commit to going 2.0 on its own. To do that, students will need to use their voices and build up support so administrators implement College 2.0. By pushing their schools to be among the first 2.0 institutions, students can have an impact, make history, and pave the way for other colleges to follow. The IRS-to-college pipeline for collecting and distributing graduate contributions will need approval from Congress, as will other aspects of the plan like allowing veterans to attend College 2.0 schools on the GI Bill. Overwhelming student support, bolstered by the voices of parents, community members, faculty, and administrators, can push Congress to approve such legislation. Our first policy blueprint focuses on the future of higher education, but College 2.0 is just the beginning. FICS America's next release will address the needs of current student loan borrowers. In the future, we would also like to solve the problems facing other education systems. But we can't do it alone. FICS America is a 501(c)3 nonprofit organization that depends on the generous contributions of those who share our vision for innovating new solutions to America's greatest policy questions. Please consider supporting our continued work.